It's a success. A quad-core SoC, Android 4.4.2, a Full HD display, and all that for only 200 Euros (~$256). 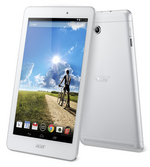 The 8-inch Acer Iconia Tab 8 tablet offers a lot of good hardware at a low cost. As our review shows, what looks good on paper looks good in practice too. Z3745: Soc with an integrated quad core Atom processor clocked at up to 1.86 GHz (Turbo), an Intel HD Graphics GPU and a dual channel LPDDR3-1067 memory controller.» Further information can be found in our Comparison of Mobile Processsors.